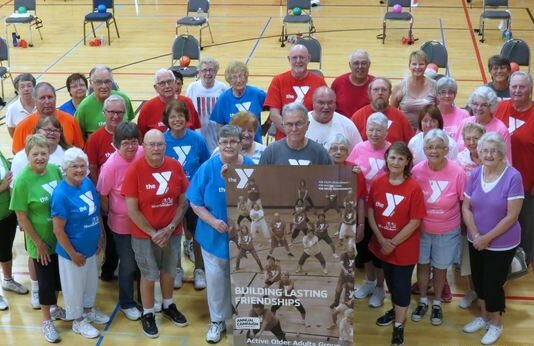 The YMCA Senior Programming classes and events welcome mature adults, AOA members, AARP® Medicare Supplement Program, Renew Active, Silver&Fit®, SilverSneakers® members and seniors. Through physical activity, classes and social events, the YMCA Senior Programming provides you with a strong sense of belongingness and a network of friends who provide supportive communities for sustained health and well-being. On-going fun, safe, and engaging programs, activities, and events help to encourage older adults to take greater control of their health. For more information or questions, please contact Joyce Sesing, AOA Coordinator, at 920.921.3330 x308. Refer to the Schedules page for a complete schedule of land and water fitness classes offered. AOA group fitness classes are designed to improve cardiovascular fitness as well as muscular strength and endurance while increasing range of motion and flexibility. These self-paced conditioning classes are suitable for all fitness levels with the added benefit of being low impact and gentle on the joints. A variety of equipment will be utilized to personalize your workout. All group fitness classes are free to members. Community Participants may purchase a day pass to attend a class. Land Fitness :: Tuesdays & Thursdays, 10:15 to 11:00 am Low impact workouts that incorporate weights, stretch bands and low intensity cardio. Classes held in the Community Gym. Balance & Strength :: Mondays & Wednesdays, 8:00 am to 8:45 am Designed to help make everyday activities easier by increasing your balance and strength with both traditional and functional exercises. All levels of fitness are welcome. Zumba Gold :: Wednesdays, 10:30 am to 11:15 am. This is a Latin inspired dance workout for the active older adult or anyone that may need modifications for success. Water fitness helps develop strength, increase muscle tone and flexibility, and provides a great aerobic workout. Beginner level class (Splash Cats) is offered every Monday through Friday from 11:15 am-12:00 pm. The AOA group meets on various dates and times during the month to partake in a wide range of activities. All members interested in Senior Programming are encouraged to participate in activities such as the senior cook book, book club, holiday parties, crafts, pot lucks, baseball game outing, dances, plays and so much more. We also have Birthday Celebrations! Each member gets their birthday celebrated. Join us one Thursday of each month for our Book Club. Books will be provided. Each member will take a turn 1-2 times during the year to bring a snack for the group. Fabulous reads and group discussions! The AOA group and others interested in YMCA Senior Programming gather at a local eatery at 12:30 pm to share food, fun and fellowship. Sign up at the Welcome Center Desk. Locations and dates can be found on the monthly AOA calendar of events. Once a month we will “embrace our age” for an evening of celebrating at a local eatery. The “Birthday Person” will be crowned and honored with balloons, candy and a homemade cake, complimented with good cheer of health and well wishes! Locations and dates can be found on the monthly AOA calendar of events.